Relational frame theory (RFT) is a novel explanation of cognition and language. It influences the clinical work that I do with anxiety and depression and, like evolutionary psychology, it manages to inject a bit of hard science into psychology’s soft, squishy center. Before we look at RFT, let’s do a quick review of what RFT is not. The problem with that explanation is that there is no such thing as “a bark.” It is not an object. There is only “barking,” the behavior. 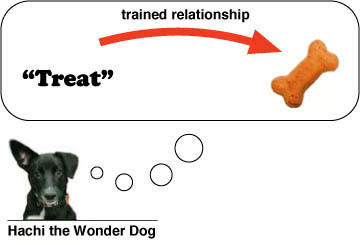 A convoluted explanation of doggy communication. More importantly, we don’t need the concept of “a bark.” Nor do we need a bark encoder. These imaginary contraptions only complicate matters and create impossible questions. Where does the bark reside before it is transmitted? How is it “encoded”? 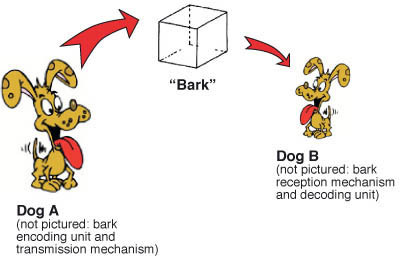 Why can’t I decode the “bark” – shouldn’t my decoder be backward compatible with a dog’s? There are quite a few contrived doohickies in this model: channel, encoder, decoder, message, and feedback. And those giant, pointy arrows flying through the air – good lord, you could take an eye out with one of those things. Luckily, none of them seem to exist. Consider the idea of a “message.” It can be a tough concept at first because we are taught to think about communication in a concrete way, but there is no such thing as a message or even a word. Sound waves exist in a physical sense but there is no physical bulletin that is intercepted and decoded. There is only noise that we have learned to interpret, and noise that we have learned to produce because it has an effect on the environment. A simpler explanation for communication. Here, we see a small human learning to affect the environment through sound (artist’s rendition). A baby begins learning speech by making all sorts of random sounds. When she makes a sound that has meaning to adults, then things begin to happen in the environment. Here, “ba” produces a bottle of tasty sustenance. Voila! Add complexity to this recipe and you have language. The learning model is a simpler, more elegant explanation of language. People learn to manipulate the environment through sound and symbols just as they learn to manipulate it with their hands: through practice. When we focus on actions, rather than imaginary objects, then we get to ask different questions… more useful questions. Questions that, ultimately, help explain human suffering. That’s where RFT comes in. Relational frame theory is the result of research by Dr. Steven Hayes, along with Dermot Barnes-Holms and several other scholarly types who have helped shape this large body of work. RFT is an attempt to fill a void left by the behaviorist B. F. Skinner. You may recall from your psychology 101 course that Skinner propelled behaviorism into the spotlight during the 1960s and 70s. Perhaps you even remember the basic three-term contingency model of behavior: Antecedent-Behavior-Consequence. The ABC model is great for explaining how people and animals get things done. For example, a child sees a tasty bit of candy at the grocery store (antecedent), he screams “I want candy!” (behavior), and the mother buys the candy (consequence). The kid has just trained his mother to supply candy on demand. Skinner explored the nuances of such interactions and showed us the wonderful interplay between organisms and their environment. Skinner was a brilliant man. But even brilliant people have their white whales, and Skinner’s was language. He struggled to explain how humans interact with each other at such a complex level. Early in his career, he feared that his brand of behaviorism couldn’t explain language at all. Later, he made a valiant attempt in his 1957 book, Verbal Behavior. Unlike the bulk of Skinner’s work, Verbal Behavior was largely theoretical. While it was filled with useful ideas about language, it fell short of explaining this pivotal aspect of human psychology. Hayes and his colleagues set out to find answers to Skinner’s unanswered questions. While Skinner was on the right track, Hayes and company added an exciting idea that seems to explain much about the why’s and how’s of human communication: humans learn how to derive relationships that aren’t explicitly obvious (I’ll explain that momentarily), and those derived relationships are applied systematically to verbal behavior (I’ll explain that, too). I’ve met Steven Hayes. He is a kindhearted, ingenious man who could find staggering complexity in a shopping list. I, on the other hand, am a pedestrian commentator with the dubious gift of oversimplification. Take the following explanation of RFT lightly. We’re going to stick to a few of the basics. 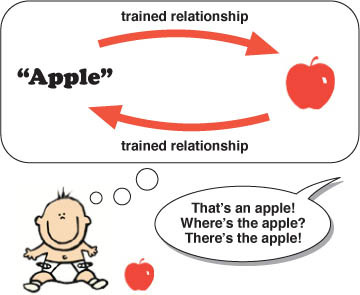 There are relationships that are explicitly taught (“that red fruit over there is an apple”) and unspoken relationships that are inferred based on relationships that are taught (therefore, apples are red fruit). Deriving the latter relationship from the former comes easy to you and me, but it took practice for us to get good at it. Non-verbal animals struggle with this skill, if they can develop it at all. They can learn both directions in a relationship (object = name & name = object) but only with extensive training and never with the effortless fluidity of humans. Suppose, for example, that I say the word “treat” and give my dog, Hachi, a cookie. Being the clever dog that she is, she quickly learns that the sound “treat” equates to the object. Whenever she hears the sound “treat” she is reminded of the smell, the taste, and the satisfaction carried by the real thing. Much excitement ensues around our house after someone utters that word. Hachi has learned that the sound “treat” means that joyous satisfaction will soon follow. It seems that, for her, the sound has taken on some of the meaning of the actual object. Try it yourself: notice what happens next time you hear the name of your favorite food. You will probably begin to imagine its sight and taste. Maybe you’ll imagine your mother’s kitchen or a favorite restaurant. If you’re hungry enough, you may even salivate. Words are more than symbols. They have a way of taking on much meaning. People, however, can effortlessly glean two, or more, relationships from one piece of information. 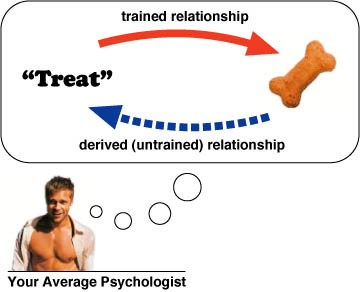 For example, if you give your average psychologist a dog biscuit and call it a “treat,” he will immediately infer that “treat” is also descriptive of a dog biscuit. He derives two relationships where only one was taught. Teach a person that a certain object goes with the sound “treat” and he will immediately infer that “treat” is also descriptive of the object. You get two lessons for the price of one: the first relationship is taught, the second is derived independently. So how, exactly, do we come by this ability? Obviously, having a few neurons in the right order helps. Beyond that, it takes practice. According to RFT, we learn to derive relationships by viewing lots of examples and then eventually applying the principle on our own. Consider our example of naming things. When we teach little children to name things, it usually follows a certain recipe. First, we show the object to the child and name it. Then we say the name and ask the child to point to the object. This teaches both directions in the object-name relationship. 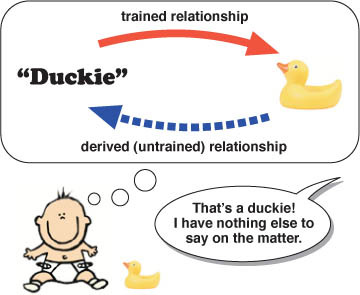 Step one in teaching Junior how to derive relationships involves many examples in which both directions in the relationship are taught (object = name & name = object). Step two. This time, only the name is stated. Junior derives the second part of the relationship by herself after seeing many different examples of how to do it. This is quite the handy time-saver! Whether you cotton to it or not, you’ll probably agree that this theory is a far cry from the old, convoluted communication diagram pictured at the top of the page. Communication, rather than being based on the manipulation of “things” like messages and channels, is based on interaction with the environment through sounds and symbols. When we do something correctly, like naming a thing, we feel encouraged to do it again. Naming things just one example of a relational frame. Turns out, we humans are skilled at deriving all sorts of relationships using only skimpy information. In part two of this article, we’ll look at other relational framing behaviors and discuss what happens when we apply them to ourselves. As handy as it is, relational framing has a downside. Hayes, S.C., Barnes-Holmes, D., & Roche, B. (Eds.) (2001). Relational Frame Theory: A Post-Skinnerian Account of Human Language and Cognition. New York: Plenum Publishers.